ICONICS today announced the launch of its Digital Twins for Smart Spaces solution, built on Microsoft's Azure Digital Twins solution. FOXBOROUGH, MA, USA, October 16, 2018 / EINPresswire.com / -- ICONICS is a global automation software provider and six-time winner of the Microsoft Partner of the Year award. The company provides advanced web-enabled OPC UA and BACnet certified visualization, analytics, and mobile software solutions for any energy, manufacturing, industrial or building automation application. 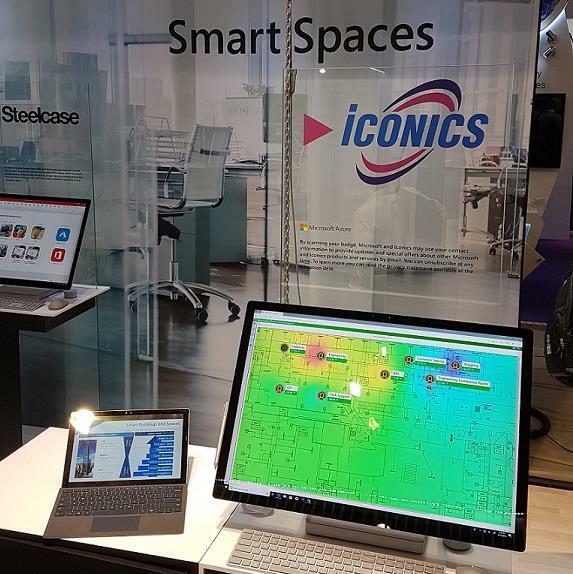 ICONICS today announced the launch of its Digital Twins for Smart Spaces solution, built on Microsoft's Azure Digital Twins solution, which provides virtual modeling capabilities for physical environments. ICONICS' Digital Twins for Smart Spaces solution delivers value in four key areas: energy efficiency, fault detection, occupancy, and comfort. By focusing on these areas of improvement, the Smart Spaces dashboard empowers facility managers, property owners, sustainability directors, and C-level executives to reduce their energy consumption and improve employee productivity through optimized comfort. The Smart Spaces solution performs real-time visualization, collection, and analysis of energy and equipment data coming from any building automation system or directly from IoT sensors. This gives building owners insight into the health of their portfolio, allows them to compare buildings to focus on best vs. worst performers, and uses big data analytics to deliver significant energy savings. The fault detection module applies artificial intelligence rules to predict when equipment might fail or use more energy than necessary. By integrating Azure Machine Learning, these predictions will grow more insightful over time, enabling facility managers to prioritize maintenance and remediation. Now, with Azure Digital Twins, ICONICS is able to bring even more advanced capabilities to its smart building solutions. ICONICS has incorporated the Azure Digital Twins object models and spatial intelligence graph to encompass powerful use cases around optimizing space utilization, improving occupant comfort, and maximizing building management efficiency. To see this exciting new solution in action, visit ICONICS in the Microsoft booth (GRAN VIA, Hall P2, Stand 321) at the IoT Solutions World Congress in Barcelona, October 16-18, 2018, or for more information visit www.iconics.com . ICONICS, a longtime Microsoft Gold Partner and six-time Microsoft Partner of the Year award winner, including the Manufacturing, Application Development, and CityNext Partner of the Year, provides solutions to improve productivity, reduce integration time and operating costs, and optimize asset utilization with visualization and automation software. Founded in 1986, ICONICS has 350,000 installations in over 100 countries worldwide. ICONICS meets the demanding application challenges of the automotive, building automation, food and beverage, government infrastructure, manufacturing, petrochemical, pharmaceutical, renewable energy, utilities and water/wastewater industries. As a managed Microsoft ISV Partner, ICONICS designs its solutions to leverage Microsoft technologies, including Windows 10, Windows Server, Microsoft .NET, Microsoft Azure, SQL Server and Microsoft SharePoint. © 2018 ICONICS, Inc. All rights reserved. AnalytiX and its respective modules are registered trademarks of ICONICS, Inc. GENESIS64, GENESIS32, Hyper Historian, BizViz, PortalWorX, MobileHMI and their respective modules, OPC-To-The-Core, and Visualize Your Enterprise are trademarks of ICONICS, Inc. Other product and company names mentioned herein may be trademarks of their respective owners.